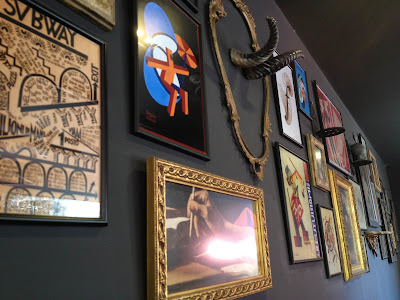 Whenever we are given the exciting opportunity of going out to eat (a much-loved past-time), you'll always find me hastily Googling restaurants and thumbing through my Good Food Guide to scour out new and exciting places for us to venture out to. 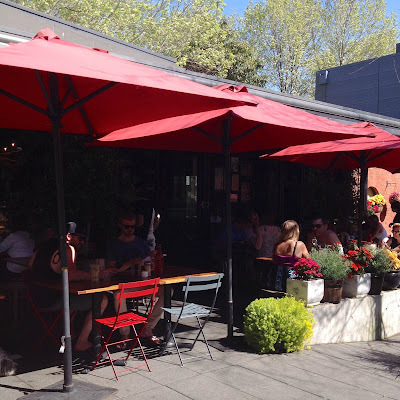 I find myself in this situation more often that not, but it always seems to end with us visiting a main eating/shopping strip and simply eating at whatever place we stumble upon that tickles our fancy. It's not that I don't love the places we go often and frequently visit, but the lure of eating at a new, much-talked about café or restaurant is almost too good to resist when presented with the chance to. It's not disappointing, per se, but once in a while I'd really like to visit that place I read about last month in the Good Food, or read about online in one of my many favourite food blogs. I keep many lists of this kind on my phone, whiteboard and notebooks, but whenever the opportunity arises I never fail to find myself caught up in a frenzy trying to decide on a place to go to eat. I really should be organising myself better. It was in this frenzied state that we visited Surry Hills - an area renowned for its eclectic café culture. We were originally there for an appointment LK had, and of course I'd spent the night before (as well as the past hour) trying to find a place to go for lunch. Walking among the hustle and bustle of eclectic Crown Street, admiring the sunny weather, we came across a charming, open courtyard blossoming with greenery and the chatter of people. Taking a look inside, we came across the higher-end eatery, The Winery, as well as a charming and friendly café called Pieno. 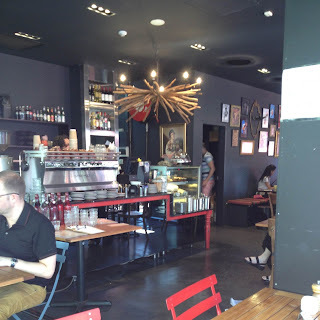 The interior of the café was modern and had some funky lighting and wall hangings with a red and black colour theme, and upon passing the patrons basking in the early Spring Sun outside Pieno, I'd caught a good glimpse of their meals - mostly paninis and sandwiches. 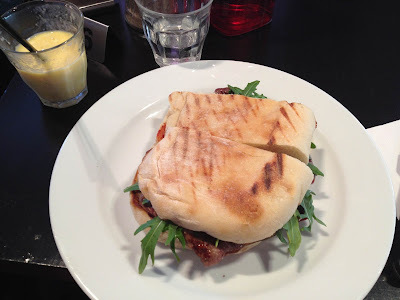 Upon grabbing a seat inside on the banquettes (Pieno also has outdoor seating for those lovely sunny days), the menu was quite extensive and featured more than your average café sandwiches and salads. The service was fast and efficient and while we looked over the menu we ordered a mango smoothie for CK and I to share as well as a mineral water for LK. 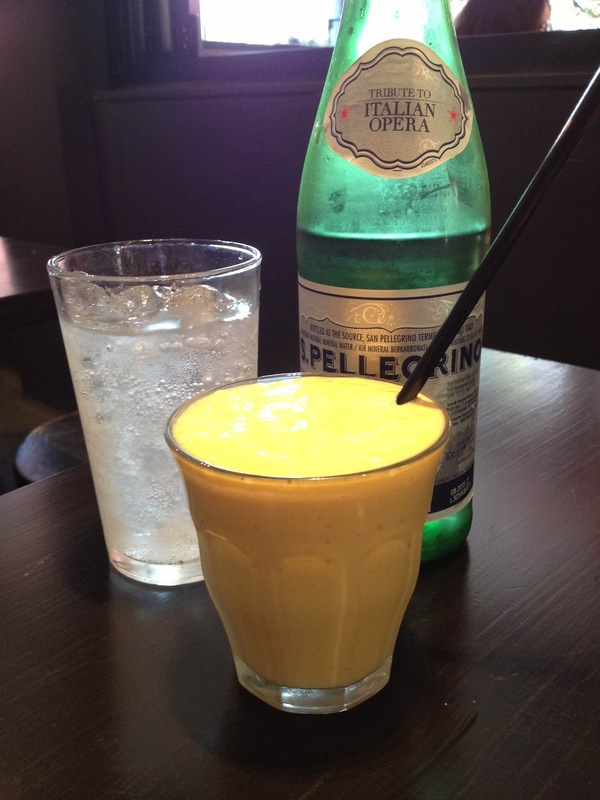 The smoothie was wonderfully cold and creamy, with a subtle mango taste that wasn't too overpowering or sweet. It was served in two small individual glasses, which was well thought out given that we were sharing it. 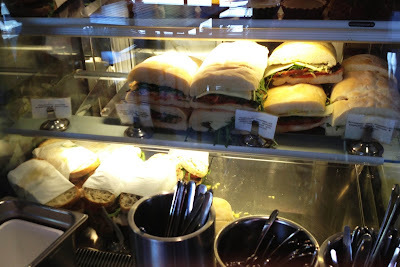 Panini, bruschetta, sandwiches and wraps feature heavily on the all day lunch menu (there is an all day breakfast menu, too) with the addition of salads, and today what I felt like was a good, hearty sandwich. 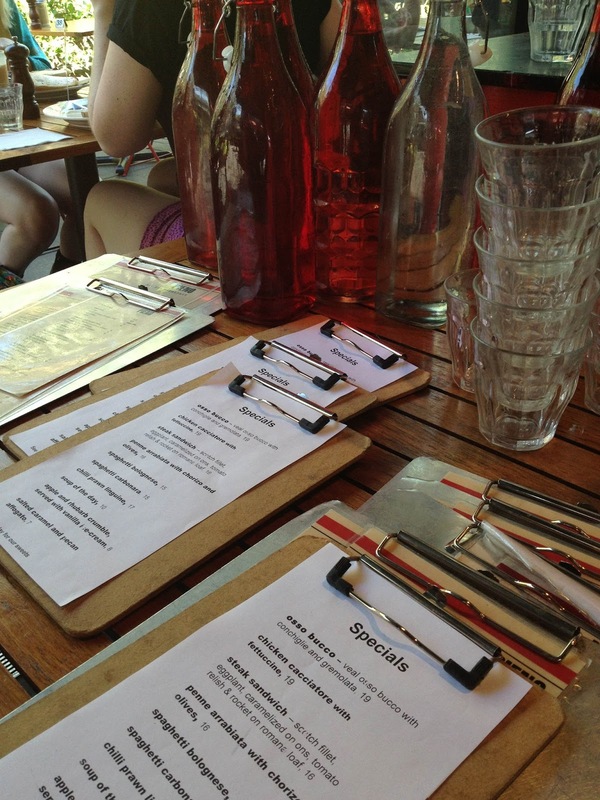 The specials menu had quite a variety of offerings, with some hearty dishes such as Osso Buco and Chicken Cacciatore, as well as various pastas. 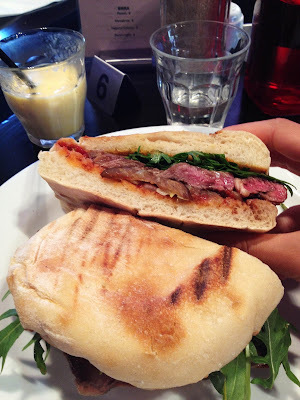 I had ordered the Steak Sandwich, which consisted of scotch fillet, caramelised onions, chargrilled eggplant, tomato relish and rocket on Romana loaf (similar to focaccia). It was served warm, with the bread lightly toasted on the outside and the steak still nice and pink inside. I'd attempted to cut it up for easier consumption, so the filling got a bit messy, but upon first bite it was all that a good steak sandwich should be. The scotch fillet was mouthmeltingly tender, though a little hard to bite in some bits (like all steaks are when you get that muscley/fatty bit), and had a nice flavour from the little bit of fat that was left on in the cooking. The eggplant nestling under the meat was a surprising addition, but it went perfectly with the sandwich although there were only a few sparse slices scattered underneath. Of course, it wouldn't have been the classic steak sandwich if it weren't for the sweet, soft onion and tomato relish lathered onto the bread. It was quite a large portion given that I normally give a bite or two (or a quarter) to LK or BK, but today I had to finish it all myself and ended up quite on the over-satisfied side of full after I'd also finished my smoothie. If you happened to be watching me eat that day you perhaps you would've glimpsed the sloppy manner in which I ate and deconstructed my sandwich, but I thoroughly enjoyed it nevertheless. 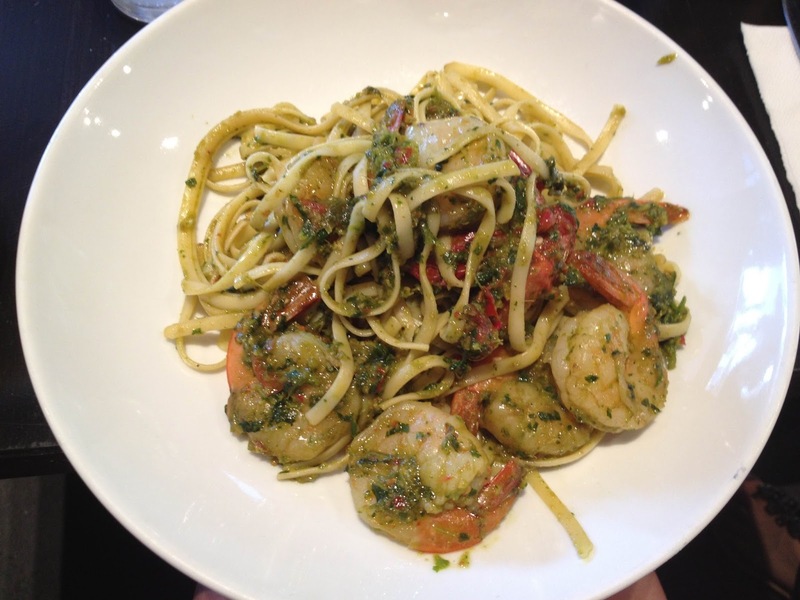 CK had the chilli prawn linguine, which had just the right amount of oomph (chilli) for her. Although not specified on the menu, the pasta came with a coriander and ginger pesto-like sauce that gave the dish a surprisingly Asian flavour that was quite different but moreish. Tossed into it were plump prawns and blistered cherry tomatoes, which were a yummy touch. 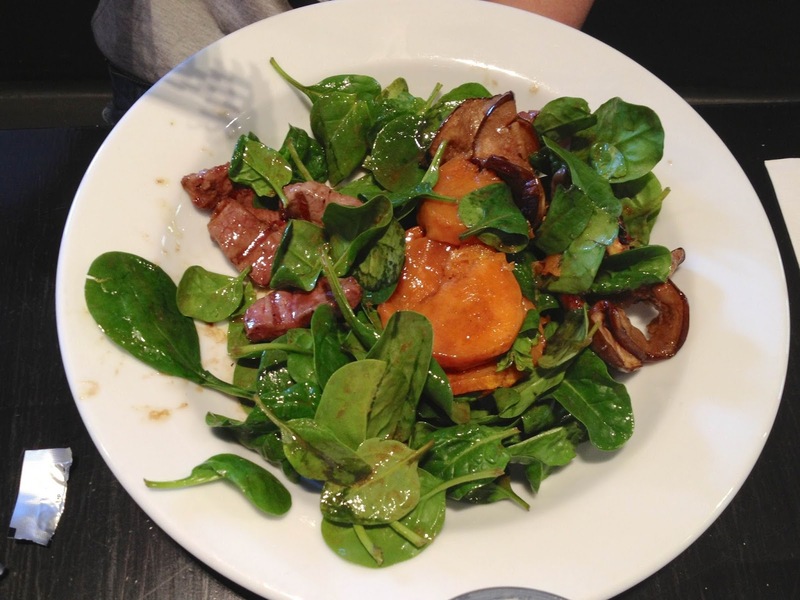 LK had settled on a meaty salad, which was served warm with chargrilled lamb, roasted sweet potatoes, eggplant and baby spinach. It was the kind of salad that was light but hearty at the same time, given by the addition of lamb and eggplant, which was scrumptious. The balsamic dressing wasn't too heavy or overpowering and complemented the sweet potato - roasted so that it was sweet and soft - really nicely. Desserts are listed on the specials menu (Apple & Rhubarb Crumble with ice cream when we visited), as well as a good selection of sweets displayed on the front counter that include mini tarts, chocolate muffins and Turkish delight. We walked off our full bellies after lunch browsing the cute boutiques along Crown Street, and paid a much anticipated visit to the American Apparel Attic while we were there (above the main American Apparel Store on Oxford St perpendicular to Crown St) . Oh, and in case you were wondering, pieno in Italian translates to full. 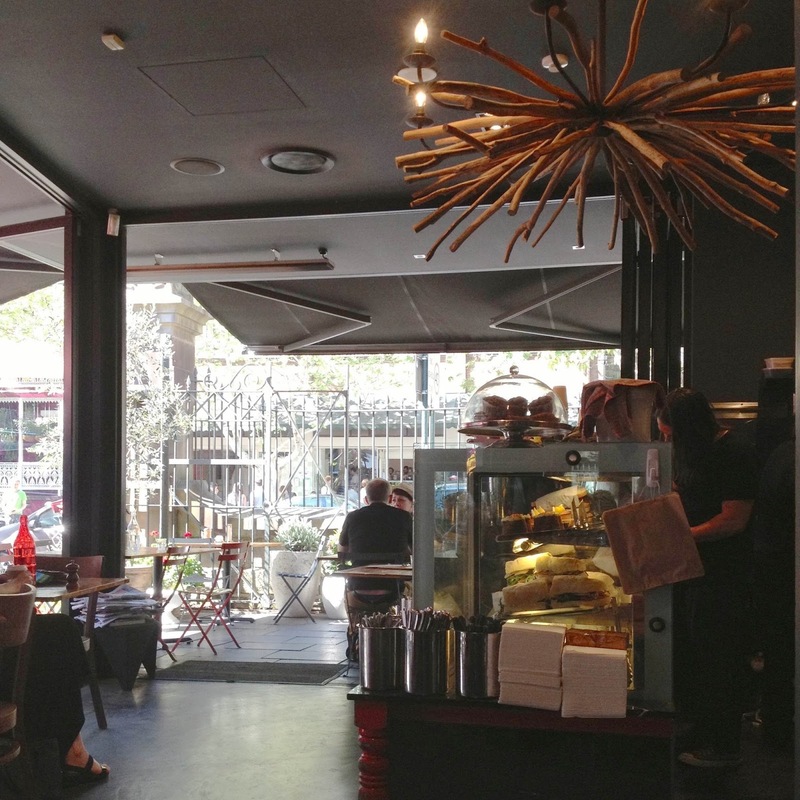 A very fitting name for a café to visit when you don't know where to go whilst wandering around in Surry Hills in a food frenzy.